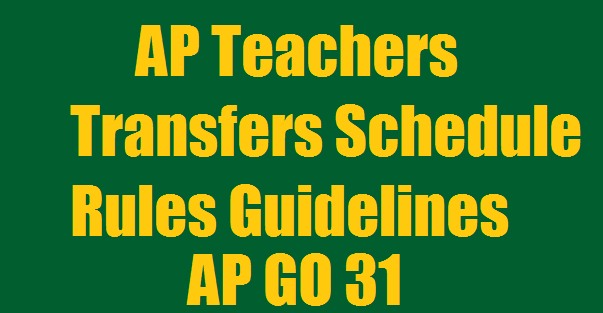 AP GO 31-AP Teachers Transfers 2017 Schedule Rules Guidelines #AP GO 31-AP Teachers Transfers 2017 Schedule Rules Guidelines released. As per G.O.Ms.No. 31 Dated: 31.05.2017 Entitlement points Norms Eligibility Web Counselling Applicability of Teachers and Headmasters Apply online at cse.ap.gov.in Government Of Andhra Pradesh Rules - The Andhra Pradesh Teachers (Regulation of Transfers) Rules - Orders – Issued. Rules - The Andhra Pradesh Teachers (Regulation of Transfers) Rules - Orders – Issued. 1. G.O.Ms.No.63, Education (Ser.II) Department, Dated:31.08.2015. 2. CSE Lr.No.4102/Est –III/2015 dated 23.3.2017. 3. CSE Lr.Rc.No.190/Est-III/2017, Dated: 10.04.2017. In order to facilitate and regulate the transfers of Headmasters Grade II Gazetted and teachers working in Government / ZPP / MPP schools in Andhra Pradesh School Education Service and the Andhra Pradesh School Education Subordinate Service, Government have decided to issue rules relating to transfers. 2. Further, under Right to Education (RTE) Act 2009, every child in the age group of 6 to 14 years is to be provided upto Eight years of Elementary Education on admission to an age appropriate class in the vicinity of his / her neighborhood. Further, there is a need to rationalize the staff in schools and posts in Primary, Upper Primary and High Schools as there are some schools with higher enrolment of students vis-à-vis the sanctioned teaching posts and on the other hand there are some schools with uneconomic enrolment of students with more the justified teacher posts. Government desires to ensure appropriate school/class level teacher – pupil ratio and strengthen academic monitoring / support to teachers at mandal and divisional level. Keeping the above in view, there is need to regulate the staffing pattern by way of transfers. 3. The Commissioner of School Education will take action to call for the applications for transfer of teachers through online and conduct web counseling duly obtaining the options every year after the closure of academic session for that year. A proper time schedule would be announced by the Commissioner of School Education for this purpose which will lay out all the details including time frame for application, counselling, grievance redressal, issue of orders and relief and joining of HM/teachers. The Headmasters/teachers shall apply online at the IP address given for the purpose. 4. For the purpose of Transfers of Teachers, the assessment of Teacher posts required in any school will be based on U-DISE of the previous academic year with cutoff date as 31st December. 5. In exercise of the powers conferred by Section 78 and 99 of A.P. Education Act 1982 (Act 1 of 1982) and under Article 309 of the Constitution of India and in supersession of all the earlier Rules and guidelines on transfer of teachers, the Government of Andhra Pradesh hereby makes the following Rules regulating the transfers of the categories of Headmasters Gr.II Gazetted, School Assistants and Secondary Grade Teachers and their equivalent categories in the A.P. School Education Service and in the A.P. School Education Subordinate Service working in the Government Schools and Z.P.P. and MPP Schools in the State. 6. The Commissioner of School Education shall be competent to remove difficulties/ issue clarification for smooth and proper implementation of these orders. Govt will be competent to modify/ amend these rules, if required at any point of time. 7. Government in the Department of School Education, shall be competent to transfer teachers if required, on administrative grounds, outside these rules/framework and time schedule during an academic calendar. 8. Work adjustments orders to shuffle teachers can be carried out by the Commissioner of School Education during an academic calendar year to ensure proper and optimum utilization of HM/Teachers in schools wherever their services are required for the purpose of better academic performance of the students. (i)	These rules may be called the Andhra Pradesh Teachers (Regulation of Transfers) Rules. (ii)	These rules shall be applicable to Headmaster Gr.-II Gazetted in the Andhra Pradesh School Education Service and School Assistants / Secondary Grade Teachers and other equivalent categories in Andhra Pradesh School Education Subordinate Service, herein after referred to as Teacher in these Rules. (iii)	These rules shall come into force with immediate effect. (i)	The following categories of Headmasters Gr.II Gazetted / Teachers in the Government / ZPP /MPP shall be transferred. (a)	Those Teachers who have completed 8 Academic calendar years of service and those Head Masters Gr.II who have completed 5 Academic Calendar years of service as on date of closure of schools in a particular school in the Academic year in which transfers are to be taken up shall be transferred compulsorily. (More than half the academic year would be considered as a complete full year for this purpose and less than half would not be considered). (b)	Provided those who are going to retire within two (2) years from 30th April of the year in which transfers are to be taken up shall not be transferred until and unless the incumbent requests for such transfer. (ii)	(a)	The male Headmaster Gr.II / Teacher aged below 50 years as on 30th April of the year (in which transfers are to be taken up), and working in Girls High School. (b)	If no women Headmasters Gr.II / Teachers are available to work in Girls High Schools, then the male Teachers who crossed 50 years of age as on 30th April of the year, in which transfers are to be taken up, may be considered for posting to such schools. (iii)	Headmaster Gr.II / Teachers who have completed a minimum period of two years-service in a School as on 30th April of the year, in which transfers are to be taken up, shall be eligible to apply for transfer. (iv)	(a)	The teachers being shifted on completion of the Rationalization exercise (i.e.) Primary Schools, Upper Primary Schools and in High Schools shall be preferably posted to those schools where such new posts have come up due to rationalization. In case such Teacher is not willing for that, they can be allowed to participate in the transfer counseling by following the norms. (b)	Criteria for identification of teachers being shifted on Rationalization: Junior teacher as per the service in the cadre. If senior is willing, senior teacher may be shifted duly obtaining a declaration counter signed by the inspecting officer concerned. Requirement of teachers in such schools where inadequacy of teachers exists would be preferred. (v)	The Headmasters Gr.II Gazetted and Teachers who have completed 5 and 8 years of service respectively as NCC officer should be posted in a vacancy in a school where there is NCC unit. (vi)	Preference shall be given to Head Master Gr-II, who have studied the language concerned (Urdu / Tamil / Kannada / Oriya) Language as 1st Language as main subject to the respective Medium Schools. (vii)	The number of years of service completed in a particular school, in a particular cadre should be taken into consideration. (viii)	Visually challenged teachers are exempted from transfers. However, if such teachers desire to apply for transfer may apply for transfer counseling. (ix)	(a)	Transfers shall be effected from within the Present Management in which the teacher / Headmaster Gr.II is working. (b)	If the Teacher / Headmaster Gr.II desires to go to his / her parent management such Teacher / Headmaster Gr.II may opt for transfer to only those vacancies available in their parent management. (d)	As per G.O.Ms.No.3 Tribal Welfare Department, Dated:10.01.2000, Headmasters/ Teachers belonging to local tribes are to be posted in Agency areas. (e)	Non Tribal Headmasters/Teachers currently working in Schools in agency areas may also apply for transfers to plain area. (f)	Normally as per G.O.Ms.No.3, Dated: 10.01.2000, teachers working in Plain areas may not be posted to Agency Area. However, if there are large number of vacancies in Agency Area, Plain Area teachers shall be posted in Agency Area on tenure basis, temporarily for a maximum period of 2 years in the interest of Tribal students and for continuing instruction in the schools in Tribal Area. Such teachers shall be reposted to plain areas as and when the post is filled with a tribal teacher through recruitment or on completion of 2 years tenure whichever is earlier. -	In case of Villages / Towns which were in one category earlier and later changed to the other category (as per HRA / Road condition) in such cases the entitlement points may be calculated proportionately. (iii)	The District Collector & District Magistrate shall publish the list of Habitations & Category in the district which do not have connectivity through an all-weather road as per the norms of Panchayat Raj (Engineering) Department in consultation with the Superintending Engineer, P.R. of the district and the same shall be final. (iii)	Teacher whose spouse belongs to State Government or Central Government or Public Sector undertaking or Local Body or Aided Institution or A.P. Model Schools under Aided post category and working in same District / Zonal Cadre or Adjacent District. Headmasters/Teachers may opt for transfer to a place within the District or to Adjacent Mandal / Division to the neighboring District towards the nearer place of working of his/her spouse. The benefit of spouse points shall be applicable to one of the spouses once in 5/8 years only. An entry to this effect shall be recorded in the SR of the Headmaster/teacher concerned under proper attestation. The Gr.II Headmasters/teachers who are affected by rationalization are eligible for extra points over and above already secured points. Gr.II Headmasters/ teachers who have completed 5/8 Academic Calendar years’ of service are not eligible for Rationalization points. (b)	Marks obtained by students as per CCE of any additional Assessment conducted for 2 preceding academic years. If not available for preceding 1 academic year. Note:	i. The criteria for determination of the above performance parameters shall be two preceding academic years. (1 year, where not applicable). iii. Applicable to the HM / concerned Teachers. (b)	Priority to the candidate basing on the date of birth (Senior) besides rule (a) and (b). (a)	Physically handicapped i.e., those with not less than 70% orthopedically-handicapped / Visually challenged/Hearing Impaired. (j)	Spouse of the Service Person in Army / Navy / Air force. Note 2:	The Headmaster Grade-II Gazetted should avail either the preferential category (Rule 12) or the special points Rule 7 (I to VII) once in 5 years and an entry is to be made in his/her SR.
(a)	All the existing clear needy vacancies arrived at, based on rationalization exercise, except the leave vacancies. (b)	Needy vacancies for Academic & Administrative purposes, including vacancies remained unfilled in Agency Areas. (d)	Resultant vacancies arising during counseling. (e)	Long period vacancies likely to arise due to Maternity leave, medical leave beyond 4 weeks should not to be notified. They can be filled up by work adjustment. (g)	Upgraded posts of School Assistants (Languages and Physical Education) as per GO.MS.No.144, Finance Department, Dated:02.08.2016 and also posts of Gr.II Head Master due to filling up of MEO posts in the State on adhoc basis shall be treated as vacancies. The effected persons should participate in the transfers counseling with entitlement points applicable to their previous stations. (ii)	After assessing requirement at school level, additional Posts/Teachers to be provided to ensure School and Class level Teacher Pupil Ratio & for strengthening academic monitoring. Single teacher schools shall be made double by notifying vacancy, if not consolidated for valid reasons. (iii)	The Headmaster/Teacher vacancies shall be computed based on the UDISE data with cut-off date as 31st December of preceding year and by taking into consideration the teacher pupil ratio and as per the rationalization norms as notified by Government from time to time. This shall be reconfirmed by the competent authorities after field level verification with the approval of District Collector (District Cadres) or Commissioner of School Education (Zonal Cadre), as the case may be. (b)	The School wise vacancy position of Headmaster Gr.IIGazetted/School Assistant/Secondary Grade Teacher and equivalent categories for counseling. (c)	Subject to the procedure prescribed in clause (2) below, the list of names of the Headmaster Gr.II Gazetted / Teacher who applied for transfer with entitlement points. (ii)	After the last date for applying for transfers as per schedule, the seniority list shall be prepared, using software for generating the entitlement points management wise, category wise, subject wise, medium wise and the seniority list with entitlement points shall be published in the website specified for the purpose and also on the notice board of District Educational Officer /Regional Joint Director of School Education. (iii)	After completion of the online submission, the applicants shall thereafter obtain the printout of the application from the specified website and submit the same duly signed to their respective authorities, viz., Mandal Educational Officer/Headmaster High School/Deputy Educational Officer, as the case may be. (iv)	The Headmaster Gr.II Gazetted / Teacher who is eligible as per the criteria prescribed in Rule 5 may apply online through website specified for the purpose in the prescribed proforma and the particulars furnished in the proforma shall be final and no modification shall be allowed. (v)	An applicant seeking to apply under Preferential categories / spouse category shall also submit along with application the latest certificate from the competent authority in that regard. (vi)	After receipt of applications, the authorities concerned shall display the provisional seniority lists and call for objections if any. After redressing the objections / grievances, the authority shall display the final seniority along with the entitlement points in the website / notice board. (viii)	If any Headmaster Gr.II Gazetted / Teacher who is compulsorily transferable under Rule 5 does not apply online or having applied does not attend the online counseling and exercise his/her options shall be transferred to the available left over needy vacancies in category III & IV schools, apart from taking disciplinary action deemed fit. (ix)	Any HM / Teacher who is under compulsory transfer and does not apply / submit his / her transfer application serious view will be taken against the Teacher / H.M. and M.E.O. and appropriate disciplinary action initiated. (i)	Objections if any in respect of the seniority list and entitlement points published as per Rule 13 (2) may be filed online by any applicant together with evidence in support of such objection within the time specified for this purpose in the schedule. (ii)	The District Educational Officer / Regional Joint Director of School Education, as the case may be, shall cause verification of all objections and pass orders through a counseling system at district level disposing of the same. In cases where objections are upheld, the District Educational Officer/ Regional Joint Director of School Education shall cause the necessary corrections in the seniority list and publish the same on the website. (i)	Transfers and postings of Headmasters/Teachers shall be done on the basis of entitlement and performance points as specified in these rules. (ii)	After finalization of seniority lists and notification of vacancies, Options shall have to be exercised by the teachers through web assisted counseling. If specifically requested by an applicant the designated committees for transfer will provide counseling. (iii)	Transfer orders shall be issued by the respective Committees on the basis of the final lists drawn online duly following the above procedure. (a)	Senior Officer of the Department nominated by the Commissioner of School Education, not below the rank of a Joint Director. Note: (i)	The senior most officer shall be the Chairman of the Committee. Note:(ii)	The Committee shall be the competent authority for transfer of all Headmaster Gr.II Gazetted in the Government High Schools in the respective Zone. Counseling shall be done by this committed with the support of online Counseling system. Note: (ii)	The Regional Joint Director of School Education concerned shall be the competent authority to issue transfer orders of the Headmasters Gr.II Gazetted working in ZP High Schools, after the approval by the Committee Counseling shall be done by this committee with the support of online counseling system. Note:	The District Educational Officer concerned shall be competent authority to issue transfer orders to all the teachers working in the Government Schools and ZPP /MPP Schools after the approval by the Committee. (i)	The competent authorities concerned shall issue posting orders to all the HMs /Teachers of one category in one proceedings only, duly enclosing the names of the teachers transferred and places of postings on transfer in one annexure. No individual transfer orders shall be issued. (ii)	The teacher / HM who are to be compulsorily transferred and who do not apply for counseling, shall be given posting orders in absentia to the left over needy vacancies at Category III & IV at the end of the web counseling of that particular category of teachers. (iii)	Once transfer orders are issued by the competent authority with the approval of the committee, review or modification of orders shall not be considered, either by the committee or by the competent authority. (iv)	In all the orders of the transfer, the condition is to be included that the orders shall be subject to outcome of SLP in Supreme Court of India and other pending cases. (v)	The transfers effected shall be displayed on website and also at the office of Regional Joint Director of School Education, District Educational Officer and ZP after completion of counseling. (i)	The Headmaster Gr.II Gazetted / Teacher who are on transfer shall be relieved within 7 days from the present place of working on receipt of the transfer orders and he / she shall join in the new school where they are posted on the next day of issue / receipt of orders. Provided the Teachers (including subject teachers) who are transferred under Transfer Counseling shall be relieved subject to the condition that there shall be 50% of regular teachers (fraction shall be treated as One) working in the school and also only the senior most Teachers (including subject teachers) shall be relieved. c.	If three Teachers (including subject teachers) are working in the School and got transfer, the two juniors in the school shall not be relieved without substitute. d.	If four Teachers (including subject teachers) are working in the school and got transfer, the two juniors in the school shall not be relieved without substitute. e.	Likewise, if eleven Teachers (including subject teachers) are working in the school and got transfer, the six juniors in the school shall not be relieved without substitute. (ii)	A Headmaster Gr.II Gazetted / Teacher who does not so join cannot claim compulsory wait, under any circumstances, for any reason. (i)	An appeal against the orders of the District Educational Officer / District Level Committee shall lie with the Regional Joint Director of School Education concerned, and an appeal against the orders of the Regional Joint Director of School Education shall lie with the Commissioner of School Education. Such appeal should be submitted within 10 days. (ii)	All such appeals shall be disposed off by the Appellate authorities concerned within 15 days from the date of receipt of the appeal. (iii)	The teachers who have any grievance on the transfer counseling should avail all levels of appeal provisions before going for other legal remedies. (i)	The Commissioner of School Education may either suo-moto or on an application received from any person aggrieved by the orders of the Transfer Committee may call for and examine the records in respect of any proceedings of transfer to satisfy himself about its regularity, legality or propriety. If, in any case, it appears to him that any such proceedings should be revised, modified, annulled or reversed or remitted for reconsideration, he may pass orders accordingly or remand the case with any direction so as to rectify any violation of rules or discrepancy. Such orders shall be implemented by the authority concerned. (ii)	The Commissioner of School Education may stay the implementation of any such proceedings, pending exercise of its powers under sub-rule (1) above. (iii)	Revision exercise and issue of orders shall be completed within 4 weeks from the date of issue of the transfer orders. No extension shall be permissible. (i)	(a) Any HM / Teacher, who has submitted false information and certificates, shall be liable for disciplinary action in addition to prosecution, as per rules, apart from cancellation of transfer benefit and shall be reposted to Category-III &IV area / left over vacancy. (ii)	The Member-Secretary who issued orders in violation of these rules or instructions issued by Commissioner of School Education from time to time in the matter shall be liable for disciplinary action as per rules. (iii)	The transfer orders, once issued and the appeals are once disposed off and revision orders issued, shall be final, and the HM/Teachers shall join the place of posting without any further delay. For any unauthorized absence “no work-no pay’ provision shall apply besides disciplinary action, as per rules.